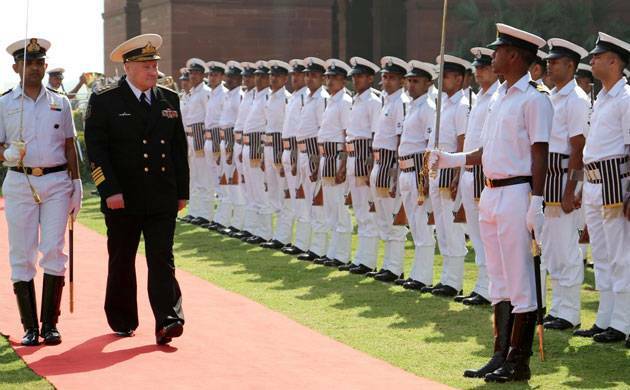 Commander-in-Chief of Russian Navy Vladimir Korolov and Indian navy chief Admiral Lanba, during their deliberations, explored new avenues for cooperation, particularly in the Indian Ocean region. Commander-in-Chief of Russian Navy Vladimir Korolev and Indian Navy Chief Admiral Sunil Lanba held extensive talks on Wednesday for stepping up naval engagement between the two countries in the wake of changing security dynamics and increasing threat of terrorism. Korolov and Admiral Lanba, during their deliberations, explored new avenues for cooperation, particularly in the Indian Ocean region. The C-in-C of Russian Federation Navy is on a four-day visit to India and he is leading a four member delegation. “The visit aims to consolidate bilateral naval relations between India and Russia, as also to explore new avenues for naval cooperation,” the Defence Ministry said. Admiral Korolov is also scheduled to meet Defence Minister Arun Jaitley, Chief of the Air Staff B S Dhanothe and Army Chief General Bipin Rawat among others. The Indian Navy cooperates with the Russian Federation Navy on many fronts including operational interactions, training, hydrographic cooperation and information technology. In addition, the Indian Navy and the Russian Federation Navy have been conducting the bilateral Maritime Exercise ‘INDRA NAVY’ since 2003. Eight editions have been held so far, the last being held off Visakhapatnam in December 2016.